KOKOMO, Ind. — J.R. Pico speaks three languages, has earned multiple advanced degrees, and teaches college-level Spanish at Indiana University Kokomo. JR Pico with some of the local children. See more photos here.But he finds that because he is Hispanic, some people believe he must be an illegal immigrant who only speaks Spanish, and is illiterate. As an educator, he sees it as his job to dispel some of those myths about Hispanic people and culture. He accomplishes this both through campus and community activities, and by leading humanitarian trips to his native Colombia. This month he is leading campus activities for Hispanic Heritage Month. "This is a good way to educate our students and community about the Hispanic world, Hispanic values, and Hispanic culture," Pico said. "There are more than 500 million people in the world who speak Spanish, in many countries. We're unified by our language, but we have different values." Pico's passion is for humanitarian service. 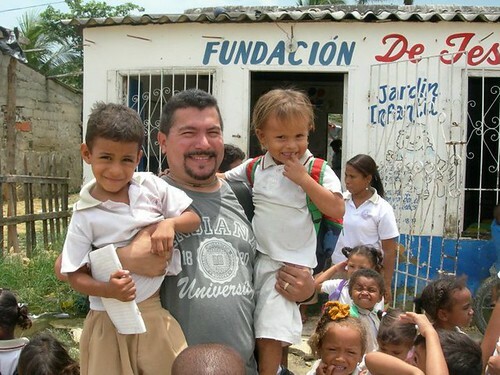 He leads at least three trips each year, taking Americans to give donated school supplies, clothes, and other items to children in Cartagena, Colombia, through Fundacion Cartagena, a non-governmental agency. His trips are not sponsored by any university or college, so they are open to students and families nationwide. Because Colombia is on a travel-warning list from the U.S. Department of State because of violence in certain areas, Pico said some potential travelers are nervous about going there, but "when they get there, they love every moment." He's never had any travelers threatened or injured, he said, and they have a positive learning experience. "For me, it is incredibly good to see students from Kokomo who have never been outside Indiana have this experience. They come back saying, 'I have seen the world from a different perspective, and this has been a life-changing trip,'" Pico said. "They've learned about another culture, another language. They learn the world is not just one way. That is my best motivation to continue leading these trips." Nida Zia, an IU Kokomo graduate who is now in the Master of Arts in Liberal Studies program, said going on the trip made "a lifelong impact" on her. "I was transcended to a very different culture, and it taught me about how we as human beings are so similar," Zia said. "The visit also made me realize how much I want to give back after furthering my education. I want to help and be able to communicate with the people in the village and the hospital we visited." Zia has started learning Spanish since her trip to Colombia, and plans to go to medical school. "It's my hope that after completing my education, I can go back and provide medical care to the many who lack access to any health care," she said. Pico said his humanitarian focus is on children because, "I am an educator, and children are the future. If we educate the children, they will develop into good citizens." The students volunteer at a cancer hospital for children and schools, providing coloring books, toys, clothes, and supplies they collect year round. The trip is not all work, however. They also visit museums, take cooking classes and dance lessons, and participate in water sports. "The best of Colombia is its people," he said. "The children steal your hearts away. In our culture, we don't shake hands. We hug." Seeing Colombia's rich heritage gives them a different perspective on Hispanic culture, he said. "There are so many misconceptions about Hispanics, and you overcome those when you see it in real life." Upcoming activities include a presentation about football soccer, the passion of the Hispanic world, at 6 p.m. Tuesday, October 23, in the Kelley Center; a talk about the DREAM Act and immigration in the United States by IU Kokomo alumnus Brandon Rush at 7 p.m. Wednesday, October 24.